This coastal web atlas case study for Oregon, USA, featuring the Oregon Coastal Atlas (OCA), describes a web site where people interested in coastal and marine information for the Oregon coast can find, learn about, and utilize data about the various resources and management issues in the Oregon coastal zone. The OCA currently hosts an archive of over 3,700 individual coastal data layers (including orthophotographs) and serves a variety of static and dynamic map products as well as informational tools focused on coastal places and topics. The Oregon Coastal Atlas (OCA) is multi-group project established by a partnership between the Oregon Coastal Management Program (OCMP), Oregon State University (OSU) Department of Geosciences, and Ecotrust, a non-governmental organization based in Portland, Oregon. The project group formed in the year 2000, received funding in the fall of 2001, and launched the Atlas on the Internet in December 2002. A major revision of the website interface was undertaken in 2007 resulting in the current version of the OCA which launched in March 2008 and is visible at http://www.coastalatlas.net. 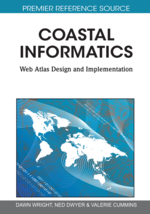 As a relatively mature Coastal Web Atlas (CWA) the Oregon Coastal Atlas project has encountered and overcome many technical and institutional challenges and has incorporated many lessons learned into its current design and approach. The Atlas currently hosts an archive of over 3,700 individual coastal data layers (including orthophotographs) and serves a variety of static and dynamic map products as well as informational tools focused on coastal places and topics. The original motivation for the OCA was to make it easy to search for and retrieve datasets and information products produced by management projects in the Oregon Coastal Zone. Such data may have been collected by any of the many partner local, state, or federal agencies that participate in the federally-funded OCMP. Prior to the debut of the OCA, such data and all the related project supporting information accumulated largely in the hard copy and disk (actually often floppy disk, CD or tape) archives of the OCMP or partner agencies and as such were virtually inaccessible to the intended audience of program partners, other key coastal zone constituents, and the generally interested public. Thus the project was initially designed to address the problem of finding and sharing data products from past projects and also to ensure that data stored on older forms of digital media were migrated into current formats so as not to become technologically trapped in the past. In the process of addressing this original need, the project team realized that the archive of data would be an asset to a wider audience if paired with informational products and tools that could make the data contained in the archive more accessible to non-experts. As a result, the design of the OCA (Figure 1) evolved to address both the needs of GIS specialists, as well as non-specialists seeking to explore a special topic of coastal management concern (e.g., a local planner or resource manager) or simply learn about the Oregon coast (e.g., a coastal visitor). The project received initial seed funding from National Oceanic and Atmospheric Administration (NOAA) Coastal Services Center, which afforded the OCMP the opportunity to form partnerships with OSU Geosciences and Ecotrust to develop the OCA project idea and apply for further funding to implement the concept on a coastal zone wide scale. In late 2001, the project secured key funding from the National Science Foundation (NSF) to fund the project’s three-way partnership for three years. This base funding was augmented by various special project funding from other sources such as Federal Geographic Data Committee (FGDC), e.g., for metadata development, and early adoption of Web Map Service (WMS) services. When the initial development grants expired in 2005, the project underwent a transition in which the OCMP eventually assumed the primary stewardship role and incorporated the OCA project into its standard ongoing portfolio of services to coastal management constituents. This assured that the project would continue to be maintained and grown over time.